JOHANNESBURG -- The man accused of faking sign interpretation while standing alongside world leaders like President Obama at Nelson Mandela's memorial service said Thursday he hallucinated that angels were entering the stadium, suffers from schizophrenia and has been violent in the past. Thamsanqa Jantjie said in a 45-minute interview with The Associated Press that his hallucinations began while he was interpreting and that he tried not to panic because there were "armed policemen around me." He added that he was once hospitalized in a mental health facility for more than one year. A South African deputy Cabinet minister, Hendrietta Bogopane-Zulu, later held a news conference to announce that "a mistake happened" in the hiring of Jantjie. After Jantjie revealed his illness on South Africa's Talk Radio 702, he went on to defend his widely disputed performance, saying he was happy with how it went. "I think that I've been a champion of sign language," said Jantjie. "I've interpreted in many big events, not only the event that is in question now ... and then there was no one at all that said I interpreted wrong." But CBS' Debora Patta reported on "CBS This Morning" Thursday from Pretoria, South Africa, that there was plenty he got wrong on Tuesday with the whole world watching, according to respected South African sign language expert Pholoho Selebano, who calls the interpreter's performance a disgrace. "There was nothing; he was just throwing his hands everywhere," said Selebano. "Meaningless, like, for example, if somebody says, 'Speak English,' and I say, 'Blah blah blah blah blah,' basically that's what he was saying." Government officials have tried to track down the company that provided Jantjie but the owners "have vanished into thin air," said Deputy Minister of Women, Children and People with Disabilities Hendrietta Bogopane-Zulu. She apologized to deaf people offended around the world for Jantjie's incomprehensible signing, and said an investigation is under way to determine how Jantjie was hired and what vetting process, if any, he underwent for his security clearance. The deputy minister said the translation company offered sub-standard services, the rate they paid the translator was far below the normal levels and that in order to maintain the interpreter's concentration level, interpreters must be switched every 20 minutes. Jantjie was on the stage for the entire service that lasted more than three hours. She declined to say who in South Africa's government was responsible for contracting the company that provided the translator, or how those rules could be flouted. "It's an interdepartmental responsibility," she said. "We are trying to establish what happened." Jantjie, who stood gesticulating three feet from Mr. Obama and others who spoke at Tuesday's ceremony that was broadcast around the world, insisted in the AP interview that he was doing proper sign-language interpretation of the speeches of world leaders. But he also apologized for his performance that has been dismissed by many sign-language experts as gibberish. "I would like to tell everybody that if I've offended anyone, please, forgive me," Jantjie said. "But what I was doing, I was doing what I believe is my calling, I was doing what I believe makes a difference." 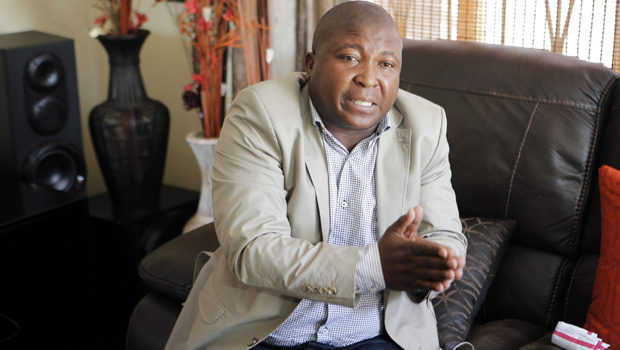 The statements by Jantjie raise serious security issues for Mr. Obama, other heads of state and U.N. Secretary-General Ban Ki-moon who made speeches at FNB Stadium in Soweto, Johannesburg's black township. The ceremony honored Mandela, the anti-apartheid icon and former president who died on Dec. 5. Many of them, including Mr. Obama, stood one yard away from Jantjie. "What happened that day, I see angels come to the stadium ... I start realizing that the problem is here. And the problem, I don't know the attack of this problem, how will it comes. Sometimes I react violent on that place. Sometimes I will see things that chase me," Jantjie said. Asked how often he had become violent, he said "a lot" while declining to provide details. Jantjie said he was due on the day of the ceremony to get a regular six-month mental health checkup to determine whether the medication he takes was working, whether it needed to be changed or whether he needed to be kept at a mental health facility for treatment. He said he did not tell the company that contracted him for the event for about $85 that he was due for the checkup, but said the owner of SA Interpreters in Johannesburg was aware of his condition. AP journalists who visited the address of the company that Jantjie provided found a different company there, whose managers said they knew nothing about SA Interpreters. A woman answered the phone at a number that Jantjie provided and said it was not for the company, and another phone number went to a voicemail that did not identify the person or company with the number. Jantjie said he received one year of sign language interpretation at a school in Cape Town. He said he has previously interpreted at many events without anyone complaining. The AP showed Jantjie video footage of him interpreting on stage at the Mandela memorial service. "I don't remember any of this at all," he said.